There is just something about a big juicy hamburger! Don&apos;t get me wrong I am all for health and wellness but sometimes you just need a nice juicy burger..right? Hendricks County has just added another great establishment to fill those burger cravings. Bagger Dave&apos;s Legendary Burger Tavern opened its doors in Avon in mid July off U.S. 36 in front of Hobby Lobby. I had to go out and try it the very first week they were open -- the sacrifices I pay for our readers. Lucky for me my sister chose this as the location for her big birthday dinner, the perfect excuse to pig out. Bagger Dave&apos;s is a chain restaurant that began in 2006 but you would never know it upon stepping through the doors. Upon entering, I was not only greeted pleasantly by the hostess but by some welcoming decor that immediately gave us the local vibe that Bagger Dave&apos;s has worked hard to create. 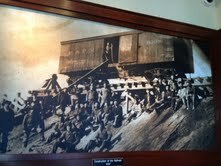 The restaurant based around a train theme has added historical photos throughout the building spotlighting the local/historical transportation industry. In fact, just after stepping through the doors, I was greeted by a large photo provided by the Washington Township Library of the Avon rail yard in years past. Not only does Bagger Dave&apos;s have great decor but they have an excellent selection of choices on their menu. Ranging from fresh salads, various sandwiches and of course several handcrafted burgers, there is something for everyone. Don&apos;t see a burger that meets your fancy? They have sheets on the table where you can build your own burger customized just the way you would like it. Coke or Pepsi? Neither... Bagger Dave&apos;s handcrafts all of their own sodas! This little fun fact was enough to make me want to come back again and again. Now I love my Coke, but I love restaurants that are original. My husband even ordered the mystery soda which was blueberry pomegranate. He said it was one of the best sodas he has ever had. All of their handcrafted sodas also are available as floats. I had a difficult time deciding on what to order for my first Bagger Dave&apos;s experience. Luckily, I had my hubby there to reassure me that he would bring me back. (I married a keeper!) I finally landed on the Blues Burger. I&apos;m a bleu cheese junky. Our food arrived in a timely fashion and was piping hot. One look at my chosen burger and I knew I had ordered well. It was big and it was cheesy! My meal was absolutely delicious. The burger was cooked to perfection and served with fresh ingredients. The fries that I chose to compliment my burger were awesome. I think I could go there and eat a bucket of them. We topped off our meal with the sinfully sweet brownie sundae which was the perfect treat for this great meal. 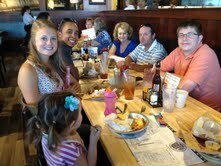 Bagger Dave&apos;s was a wonderful experience and the perfect spot to celebrate my sister&apos;s 18th birthday! The atmosphere was fun, the food was great and the price was right. When your next burger craving comes, be sure to head to Avon and give Bagger Dave&apos;s a try. Have a menu favorite? Please share so that I can give it a try on my next visit.